In some places in the world, carjacking is one of the chief dangers most people regularly face. Even in parts of the US, carjacking is incredibly common! (Detroit, for instance, has 2 a day) Knowing effective carjacking defense is a useful skill for self-defenders to have, and knowing the limits of that defense is important too. In some places in the world, carjacking is one of the chief dangers most people regularly face. Even in parts of the US, carjacking is incredibly common! 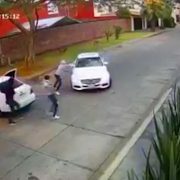 (Detroit, for instance, has 2 a day) Knowing effective carjacking defense is a useful skill for self-defenders to have, and this video shows a good path. If you value what we do at ASP, would you consider becoming an ASP Patron Member to support the work it takes to make the narrated videos like this effective carjacking defense? https://get-asp.com/patron gives the details and benefits. If you’re in the car, it’s worth considering the usefulness of the car lies in its speed. If you sit in it while it’s not running, you cannot use it to escape potential danger such as a carjacking. If you’re going to sit in the car, leave the car running, with an avenue to move (preferably forward), and preferably with the car still in drive if possible. At the very least, leave the car running. The car should be running the entire time you’re in it! When you get in, the order should be get in, lock the doors, start the engine, seat belt, drive off. When you park, the order is stop the car, gear in park, seatbelt off, stop the engine, IMMEDIATELY exit the vehicle and lock it. Do not stay in the danger zone if you can possibly help it. So many times people get decision paralysis and freeze, but you cannot stay in a place where a deadly threat exists! Either act to leave the area, or act to protect yourself. Every second you give an attacker is another opportunity they have to do you and yours harm, so don’t allow that. If you can, get out of there immediately. If you can’t, then look for your opportunity to ensure your own safety by whatever means necessary. Before your Kung Fu, and before your Gun Fu, you should consider whether your best defense is Run Fu! Most attackers can’t shoot well, and if you get more than 10-15 yards from them can’t hit you when you’re moving. So get that distance to protect yourself from carjacking! Your car is your best tool against a carjacking! Do you think about the relative values of your vehicle and your life in carjacking defense? If you value what we do at ASP, would you consider becoming an ASP Patron Member to support the work it takes to make the narrated videos like this attempted carjacking? https://get-asp.com/patron gives the details and benefits. 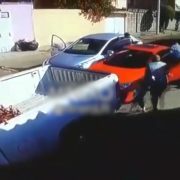 This carjacker wasn’t expecting an armed victim, but I gotta admit I laughed when he wrecks their plan! 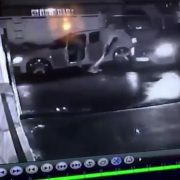 If you value what we do at ASP, would you consider becoming an ASP Patron Member to support the work it takes to make the narrated videos like these carjackers getting owned by an armed victim? https://get-asp.com/patron gives the details and benefits. Sorry, folks, I have no details on this one. If you have them, send them my way and I will add to the description. If you’re the intended victim of a carjacking, you need to know what effect that the car glass will have on your marksmanship if you have to shoot through it. Generally, the closer your shot is to perpendicular the less the glass will deflect it. If your shot is NOT perpendicular to the glass, it will tend to deviate toward perpendicular to the glass as it passes through. This means if you are shooting out of your car through the windshield, the bullet will deflect high and might deflect to the side as well if you’re not shooting straight in front of you. It’s not an exact science; recognize in a carjacking that you’re likely going to have to put a number of rounds downrange to fight off the carjacker. When the prey is armed, the predator goes hungry! When would you have drawn if you were the armed motorcyclist? If you value what we do at ASP, would you consider becoming an ASP Patron Member to support the work it takes to make the narrated videos like this motorcyclist getting the best of these muggers? https://get-asp.com/patron gives the details and benefits. What does this video teach us about defending ourselves against muggers if we’re armed? Transitional spaces are places where we MUST be more careful of potential attack. A transitional space is any location that (1) allows attackers to prey on potential victims with an element of surprise and (2) provides ready escape for the attackers. Entering and exiting your vehicle is a likely time to strike for muggers, whether that vehicle is a car, a bus, or as here a motorcycle. Take a bit of time to be more aware of your risks when transitioning into or out of your car. One of the most significant paradigms of using deadly force is called the may-should-must paradigm. “May” asks whether your force is lawful (and, if LEO, within policy). “Should” asks whether the rewards outweigh the risks of not acting or of unintended consequences. “Must” asks whether this is the only course of action that can affect the necessary outcome. Knowing how to apply this paradigm in deadly force encounters, in the moment, is an important responsibility for self-defenders! 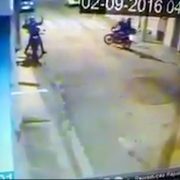 Here the armed motorcyclist met the “may”, and therefore he probably won’t have legal problems. But should and must are also important, and as a self-defender you should consider them and whether it would have been better not to engage with the gun here. Feigning compliance can be an excellent strategy in an armed robbery to buy you time to find your opportunity to defend yourself. The hands-up, palms-out posture tells the armed robbers that you’re compliant, and might give you the opportunity to defend yourself when they stop focusing on you. 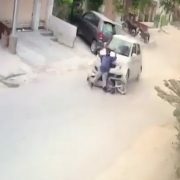 That’s what this motorcyclist did, and it worked well for him. Kidnapping is very common in some parts of the world, and even in the US it’s not unheard of! Having our Attitude, Skills, and Plan in place to use our car effectively in our self-defense plan is important no matter where we live. If you value what we do at ASP, would you consider becoming an ASP Patron Member to support the work it takes to make the narrated videos like this kidnapping? https://get-asp.com/patron gives the details. What does this video teach us about protecting ourselves from kidnapping when in our car? You must accept that danger exists and that it can happen to you. This is the foundational core of spiritual fitness and the first step in taking proactive steps to protect yourself and your loved ones. If you live in a fantasyland that nothing bad can happen because nothing bad has happened in the past, you’re setting yourself up for a terrible letdown. One of the factors that I see in this kidnapping is that the woman in the driver’s seat doesn’t appear to be ready to defend herself. Never, ever, under any circumstances allow yourself to be taken to a second location. The odds of terrible things happening to you rise exponentially when an attacker is allowed to get you isolated and in private. You must make the decision that if an attacker tries to take you to a second location that you will fight to the death to prevent that. This takes spiritual fitness, the courage to know what you’re willing to fight for. One significant strategy that works (if you don’t have tools or skills to mount a more effective defense) to keep from being taken to a second location in a kidnapping is to drop to the ground and use your legs to keep the kidnapper from moving you. Nothing good happens at the second location, so dropping to the ground can keep you from being moved! The way I talk about it is this: have you ever tried to pick up a toddler who didn’t want to be moved? It’s TOUGH! Now think about doing it to an adult. Flop down, stay on your back, and use your legs to kick the attacker off. Jiu jitsu practitioners use this strategy when grounded pretty routinely. If your car can help you avoid a carjacking attempt, you’d be a fool not to use it as the primary agent in your Active Self Protection! 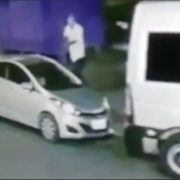 This driver used his car well both before and during, and this carjacking never stood a chance. What does this armored car owner teach us about escaping a carjacking? Transitional spaces are places where we MUST be more careful of potential attack. A transitional space is any location that (1) allows attackers to prey on potential victims with an element of surprise and (2) provides ready escape for the attackers. Wherever your car is stopped is a place where a carjacking can happen, so be aware of that chance! In any territorial or predatorial violence, the attacker gets to set the time and circumstances of the attack. They will almost always launch that attack from ambush, or as we like to call it in Umas, from “obscurity.” Surviving that ambush is one of the most important keys to successfully defending yourself. Here the car owner had time because they had the armored car to protect them from the carjacking attempt! A life of self-protection must be dedicated to avoidance, de-escalation, and escape whenever possible. You win 100% of the fights that you don’t get in, so make a commitment to de-escalate, escape, or evade any encounter you possibly can. Having good situational awareness will give you more time and opportunity to see problems coming and formulate a plan to stay away and protect yourself without danger to yourself or others. This is always our first choice as self-defenders. 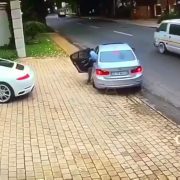 Perhaps the best way to win a carjacking attempt is to escape! I can’t believe how often I have to say this, but LOCK YOUR CAR DOORS. When you get in the car, lock the doors. If your car automatically unlocks the doors when you put it in park or shut the engine off, read your owner’s manual and change that setting. Your car door is a great barrier to keep between you and any potential carjacking, so keep it locked for your safety! Your order of operations should be get in the car, lock the doors, start the car, seatbelt on, drive off. Your car is not a private space, and you must continue to think of yourself like you’re in public. If ever you wonder if people don’t think of themselves as in public in the car, pay attention to drivers in their cars and see how often they are picking their nose or singing along at high volume. Don’t let your smartphone take all your attention when you’re in the car, either! Think of yourself as walking down the street and pay attention accordingly. 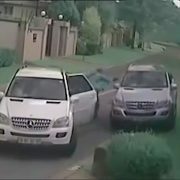 Situational awareness in your car can let you escape a carjacking faster than this guy did! Knowing how best to defend yourself against a carjacking attempt is incredibly important in most of the world! Having appropriate Active Self Protection and knowing what your best solutions are to a carjacking attempt can keep you safe. What does this video teach us about the realities of defense against carjacking? Situational awareness is your best friend in carjacking defense. It doesn’t mean that you always are paranoid or living in “condition orange,” but it does mean that you know Col. Cooper’s color code of awareness and you live by it. Pay attention to your surroundings, and recognize that when you’re in public places you need to be more aware of your surroundings than when you’re in private. Here the victim knew something was up and that gave him warning of the carjacking attempt, which gave him options. Transitional spaces are places where we MUST be more careful of potential attack. A transitional space is any location that (1) allows attackers to prey on potential victims with an element of surprise and (2) provides ready escape for the attackers. Wherever you have a stopped car in public you have a transitional space, whether that’s a carjacking attempt or a mugging. 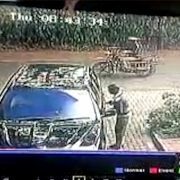 The home gates are a prime location for a carjacking in many parts of the world! In any territorial or predatorial violence, the attacker gets to set the time and circumstances of the attack. They will almost always launch that attack from ambush, or as we like to call it in Umas, from “obscurity.” Surviving that ambush is one of the most important keys to successfully defending yourself against a carjacking. The carjackers always get to set the time and place of the ambush, so surviving a carjacking attempt takes attitude, skills, and plan! One of the best ways to protect yourself against a carjacking attempt is to simply drive off. 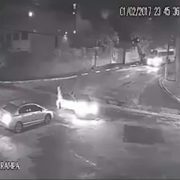 The car can get away quickly if you are ready, taking you out of danger. So be ready to drive off if you need to and there’s an avenue! Keep the car in drive until you’re ready to get out (or reverse, as in this carjacking). Keep the engine running. If you’re aware of your surroundings you can escape a lot of problems. Your car is not a private space, and you must continue to think of yourself like you’re in public. If ever you wonder if people don’t think of themselves as in public in the car, pay attention to drivers in their cars and see how often they are picking their nose or singing along at high volume. Don’t let your smartphone take all your attention when you’re in the car, either! Think of yourself as walking down the street and pay attention accordingly, because carjackings happen when you’re not paying attention.